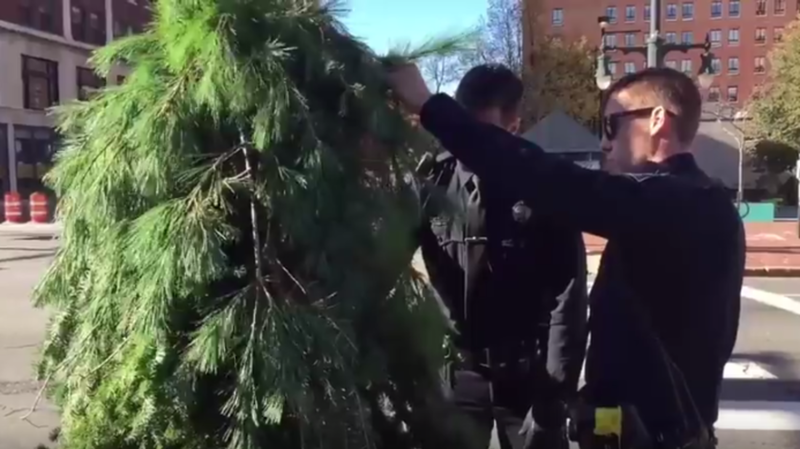 Police in Portland, Maine, were called to remove a tree from the middle of the street on Monday. It turned out to be a man dressed as a tree. Police identified the man as 30-year-old Asher Woodworth of Portland. He's been charged with obstructing a public way. Police say his motivation was to see how people would react to what he called his "performance" and how he might impact "people's natural choreography." Woodworth had to be escorted from the intersection after he declined to move along as police requested. In other words, he refused to “leaf.” It was not Woodworth's first run-in with the law over his performance art. The National Poo Museum on the Isle of Wight in the UK suffered a burglary when unknown persons broke into a drying van and made off with a load of cow patties. The specimens were being prepared for a book launch. THe museum's Nicola Winsland wrote a book of poetry called Pooems: A Humorous Anthology of Animal Poo. Winsland thinks the perpetrators did not know what they were taking. The drying process was only half-finished, and there isn't time to process more cow patties. Museum curators are on the lookout for anyone acting or smelling suspiciously. Soccer goalie Reuben Nsemoh was kicked in the head during a game last month and suffered a concussion that sent him into a three-day coma. When the 16-year-old woke up in the hospital, he could only speak Spanish! He knew a little Spanish, but temporarily lost his ability to communicate in his native English. In the time since then, his English has returned gradually, and his Spanish abilities have declined, although that may be because Nsemoh wasn't comfortable in Spanish. He apparently knew more of it than he thought. Neurolinguistics professor Dr. Michel Paradis says Nsemoh's experience isn't all that rare. Nsemoh is looking forward to playing soccer again when he is fully recovered, but his coach says he will have to wear a helmet. Christine Kiss and her husband came home to Oak Bay, British Columbia, after a five-week vacation trip and found their home had been ransacked. There were things out of place all over, but the den was almost destroyed. Some chocolate had been eaten, but no items were missing. Kiss called the Oak Bay Police Department. Officers came and found the guilty party behind the washing machine. It was a squirrel. Police took the squirrel into custody. The Kisses said they had been feeding a couple of squirrels during the summer, but they won't do that again. Eight Michigan men traveled to a cabin in the woods in Tennessee for a weekend to celebrate Mitchel Craddock's upcoming wedding. Craddock, his father, and six friends were cooking bacon at the cabin when a hungry dog came to the door. They fed her bacon and gave her water. When she started producing milk, they followed her and found her seven puppies hidden in a hole in the forest! The men washed the dogs and decided to buy dog food instead of beer for the party. They brought the mother and puppies back home to Michigan, where each man took in one dog as their own. The wedding went off without a hitch, and the newlyweds now have two dogs.